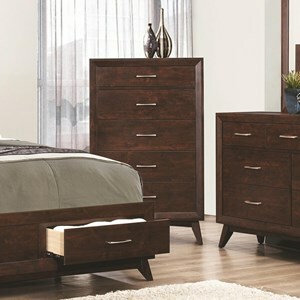 The rich warm tobacco finish softens the clean lines created by the chest drawers geometric pattern. 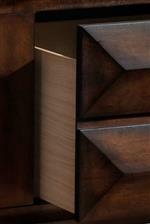 This blending of crisp lines and warmth gives dimension to the slight honeycomb feel of this chest. 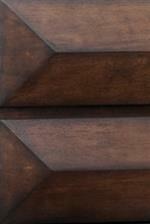 With dust proof bottom drawer and felt lined top drawer this chest is ready to safely store your clothes in style. 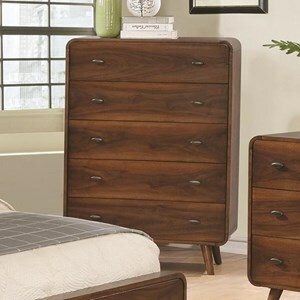 The Anthem Mid-Century Modern Chest with 5 Drawers by United Furniture Industries at Rooms for Less in the Columbus, Reynoldsburg, Upper Arlington, Westerville Ohio area. Product availability may vary. Contact us for the most current availability on this product.